Pied Starling ( Spreo bicolor fam. Sturnidae) Kruger Park Birds & Birding. The Pied Starling (Latin name Spreo bicolor) is described in Roberts Birds of Southern Africa, 7th Edition. This bird has a unique Roberts number of 759 and you will find a full description of this bird on page 968 also a picture of the Pied Starling on page 976. The Pied Starling belongs to the family of birds classified as Sturnidae. According to the Percy FitzPatrick Institute of African Ornithology the Pied Starling is also known by these other names: African Pied Starling. Endemic species is one that is confined to a specific country or region. For example certain birds endemic to South Africa only exist in that country. One such example is the Pied Starling and this species depends upon a particular habitat for survival. Destroy that habitat and the bird will possibly be lost forever. 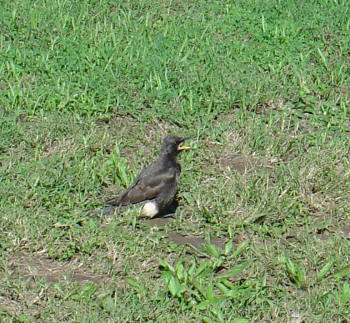 In terms of distribution of the Pied Starling in the Kruger National Park you may not see it in all areas. Pied Starling has been recorded in only 1 sections of the arbitrary Kruger Park regions I selected. The preferred habitats for Pied Starling are: woodlands and grasslands and riverine areas. The Pied Starling is also at home in wetland and bushveld areas. You will normally see the Pied Starling by itself rather than in the company of birds of the same species.